Our product range includes a wide range of phosphor bronze bush. 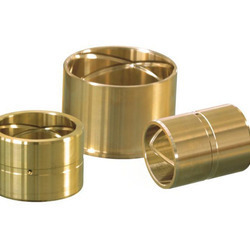 We have carved a niche amongst the most trusted names in this business, engaged in manufacturing comprehensive range of Phosphorus Bronze Spring Bushes. Offered spectrum of product is manufactured from optimum grade quality fabrication material and advance methods of production under the assistance of highly experienced professionals. These products are strictly designed as per the predefined quality control measures to ensuring high quality.